Six StandWithUsInternaitonal boats departed today from the port of Ashdod on Friday, May 28 at 1pm each including journalists from major international outlets. The boats had a massive banner draped on the side "FREE GAZA FROM HAMAS." 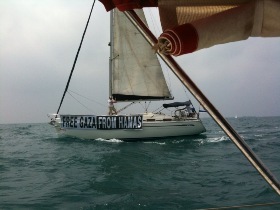 Those on board were wearing blood-stained t-shirts that say "FREE GAZA FROM HAMAS." SWU handed out copies of it's Hamas charter booklet, among other literature. They did on-board interviews in English, Spanish and Hebrew. They carried signs to "Release Gilad Shalit," the IDF soldier captured by Hamas in 2006. Lior Meir, StandwithUsInternational Fellowship Alumni Coordinator was overwhelmed by the "tons of support we received from people on the dock. They are so grateful that we went out to sea to confront these self-styled European human rights activists. It is so clearly evident that the world needs to see what the situaiton really is." StandWithUs is opposing the group of activists in nine boats who are due to arrive on Saturday off the coast of Gaza to break what they call Israel's "illegal Israeli blockade" of the Gaza Strip. "We were there today with our own flotilla of boats and signs that expose the real human rights problem-Gaza must be freed from the chains of the Hamas dictatorship and its Iranian sponsors. This has become a duel at sea of facts versus propaganda," said flotilla organizer Roman Baron, a StandWithUs Israeli Fellow. Coalitions of anti-Israel activists have organized several other similar boat trips to Gaza, but this will be the first time StandWithUs organized a full-fledged counter-demonstration at sea. The "Free Gaza" movement claims its concern is humanitarian suffering in Gaza, but in fact the boats are a media stunt to get international attention, according to StandWithUs. "If the activists were really interested in delivering their donated goods, they could easily do it through legal channels. The Israeli government offered to deliver them through approved crossings and procedures, but the anti-Israel activists' purpose is to smear Israel and support Hanyieh's Hamas regime, not help Gazans," explains Baron.